Since the first milling machine manufactured by NICOLAS CORREA, technology innovations and structural changes along time have completely transformed the look and functions of CORREA milling machines. At Nicolás Correa Service, S.A. have had a firsthand testimonial of this evolution, having the opportunity of refurbishing milling machines of all kind of models and years of manufacturing along our experience of 20 years. To face these changes, we have been always adapted, updated and especially trained ourselves willing to offer the best work in the market regarding the refurbishment of CORREA milling machines, providing our customers with precision machining, quality and guarantee. 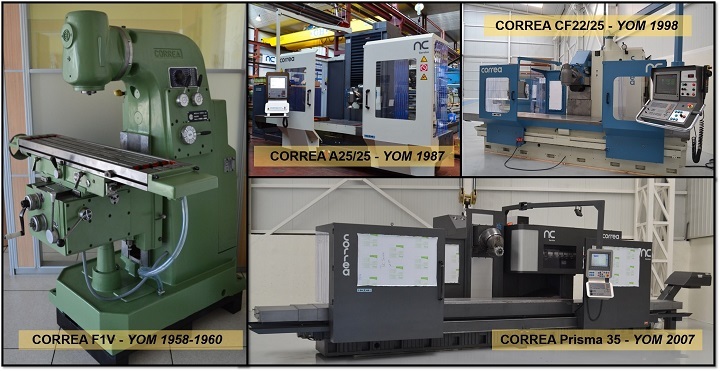 This CORREA milling machine’s evolution through some models refurbished by NC Service could be seen at the image. Evolution has been large since the first milling machine commercialized in the market, the F0, going through models of the end of the fifties as the CORREA F1V shown in the picture. In the end of the seventies, structural elements such as the bed and the position display were introduced clearly improving the quality of machining. The numerical control unit was introduced in some models as the CORREA BC during the eighties, although it was not until CORREA A10 model when a highly versatile milling machine model was standardized incorporating a CNC. From that time until nowadays evolution has gone faster, conditioned by ever-increasing demands of a tough market and mostly, a nonstop evolving technology. Our growth at NC Service has taken the hand of the development of CORREA milling machines, but we put our efforts mainly in learning how to absorb the cutting edge technology at every moment. Therefore, we do not just give the milling machines back to their original performance levels when manufactured, but we even improve the original features of the oldest machines becoming obsolete so that they have again the most updated technologies and the best quality of machining.